Teaching across national boundaries can be an exciting and challenging experience. Transnational Teaching and Learning is a comprehensive guide providing practical advice on the broad range of issues affecting academics engaged in transnational higher education. 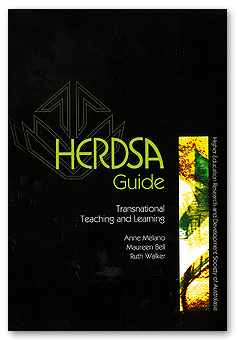 Distilling the wisdom of several dozen experienced transnational teachers as well as the research literature, this HERDSA Guide provides insights to some of the many questions transnational teachers and course coordinators might have including: How and when should case studies and examples be modified for local students, and when should they be left unchanged? Can courses be different at each location without compromising quality? Is it reasonable for universities to insist that all classroom discussion be conducted in English? How is academic integrity maintained in a transnational context? What is the relationship between culture, language, learning and teaching in transnational higher education? In an appendix, course coordinators are offered tips for designing new programs by listing crucial questions they should address to help avoid the many potential pitfalls before they occur. The Guide also celebrates the rewards of transnational teaching – the enrichment from cross-cultural encounters and the insights that teachers bring back to their pedagogical work with international students in their home universities. Much of the practical advice in the Guide has been gathered from subject and program coordinators, co-teachers, students and staff in transnational programs in locations including Australia, New Zealand, Singapore and Hong Kong. While it draws on the Australasian experience, the Guide has wider applicability.